This common saying inspired the title of my blog today. I’m putting a SPIN on what is and what things could be. You have to. I could dwell on the “bad” bur really… it’s all good. So here’s my confession… I WILL NOT BE DAILY BLOGGING ANYMORE. Sorry Ian (@technolandy). I just can’t do it. This is my learning. I’ve spent many weeks just trying to catch up to my “daily blogging” but the reality is, I need time to think and reflect. This is what I’ve learned about myself. I’m pretty content knowing and understanding this about myself. I like blogging. I like reflecting. I love learning. I am RE-COMMITTED to a weekly blog of learning. Hence, this blog is “Week 11 of 38.” It’s a NEW Friday ritual. I teach in Prince George, BC and my little family lives on the Sunshine Coast, BC. As you can see from the photo above, it snowed in Prince George yesterday. My husband kindly sends me a photo of the Sunshine Coast tonight as seen in the photo below. I’m a COASTAL GIRL living in the central interior. It’s going to snow. 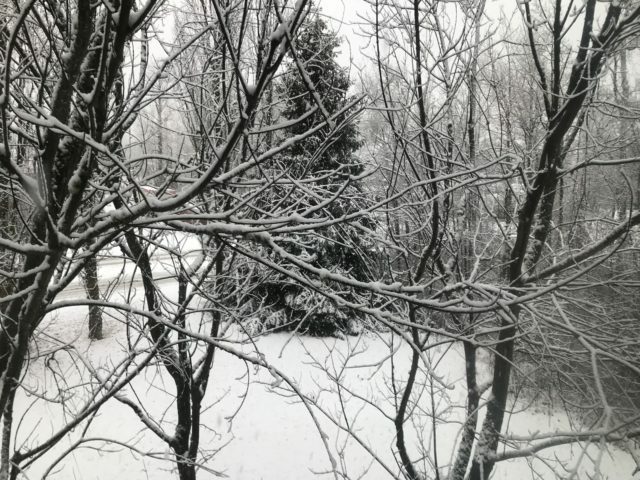 I’ve been anticipating snow for months and we have not seen the best of it yet. I believe that I will financially break even this school year in preparation for snow. I bought things that I have never owned before like a block heater, winter tires, and an electric blanket. I love my electric blanket. 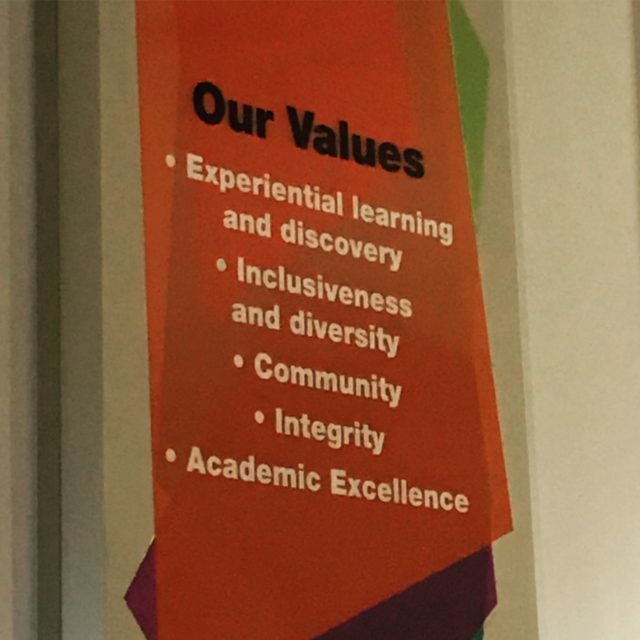 That said, I am so happy that I can visit my little family at least once a month and I get to teach at a university whose values are ALIGNED to mine. I feel very lucky. Not only to have a NEW home in Prince George (aka. apartment) where I can continue learning and pursuing my career in education, but I also own my home on the beautiful Sunshine Coast where my little family resides. I love living in both places. Of course, good things come in THREE. As mentioned, I get to work at an institution that is undergoing change. I JUST LOVE THAT. I can see how people feel uncomfortable with uncertainty and visible change (me included, at times), but I love how I can be a part of an incredible opportunity to REDESIGN our programming but also be part of the university’s redesign to create a STRUCTURE that will enable students and faculty to THRIVE… and create the best learning environment that adheres to the values of the institution. Admittedly, it gets a little cray, cray at times at work… well, most times. But I like the provost’s description of the Academic Restructuring process… DESIGN BUILDING. I love that thinking. I would much rather build as we are doing and being nimble to ongoing input and feedback versus having “pre-packaged CHANGE.” This is right up my alley and today was a day a celebration.. for me. I felt that with a lot of hard work and collaboration, we accomplished something today. 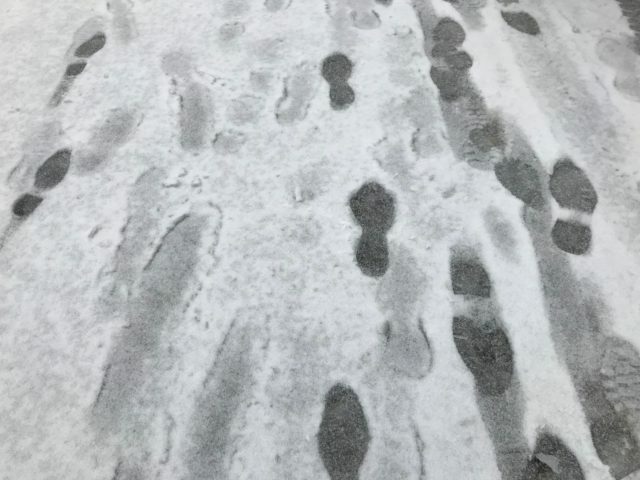 Today reminded me that EVERY STEP COUNTS. Leadership matters. Trying and putting yourself out there are necessary goods. Look at this beautiful food pic… If you don’t know me already, I’m a HUGE food pic fan. 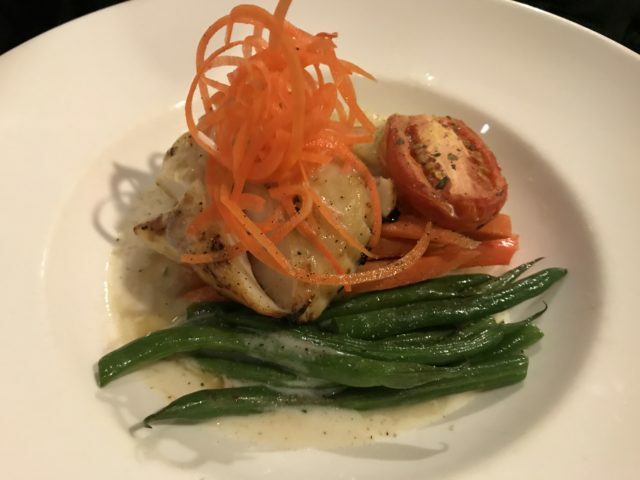 I like taking food pics and I’m pretty happy that this food pic has made my daily blog of learning. Why post a pic of food? It’s a metaphor. LESS IS MORE. Look at how simple this meal looks. My husband ordered this from the Sheraton hotel in Richmond. The appetizers and this dinner were absolutely delicious. As you can see, there is nothing to it. Cod, carrots, beans, peppers, and mashed potatoes. This meal even cost $10 more than my meal that night. It reminds me of what I am trying to convey to my students about learning activities and learning intentions. Sometimes, less is more. The choice is either depth or breath under the constraint of time. I am learning this lesson as well. I would love to go deeper on some of the student led learning activities and class discussions, but we have a time limit per class in this term. As much as I have designed this course, as my students have with their learning activities and presentations, to have an overview of some concepts regarding Curriculum and Instruction… LESS IS MORE. This is a good lesson for me and my students. This meta-experience is an exemplar that teachers are learners. They have to be… to be responsive, reflective, and reflexive. Right now, I’m feeling like I’m none of the above as I am moderating each of us with time to ensure that we can conclude this class with most of our learning intentions in tact. I am learning. Well… it’s official. I’m no longer a school trustee of School District No. 46 (Sunshine Coast) Board of Education. I served 2-terms as school trustee… 7-years of service. I was focused on enhancing the learning experiences of students. I was also focused on good governance, leadership, and educational change in light of BC’s New Curriculum. I was passionate about student voice and I appreciated being a part of the public school system while completing my doctorate degree in educational leadership. I never held a chair position, except on committees, but I didn’t need to. I was always leading from the roles I held and contributed my voice and expertise when needed. In terms of my expertise, I was in the minority of trustees on the Boards and committees I sat on. I am an educator… a practicing educator via consulting, tutoring, and higher education. My background is in K-12 education with a Bachelor, Master, and Doctorate degrees in education. Being a school trustee with this formal background in addition to my experience in BC education… I had much to say. However, in the role of school trustee… I am in governance, not the operations. Some things that I knew or believed in had no place at the board table because it was perceived as operational. I’m not the math teacher. I’m not the school principal. I was the school trustee. This is why it’s so important for boards of education to understand their role and their importance in the public education system. What I realized is, school boards and trustees do not understand (in a deep way) their potential to create change and enhance the learning experiences of students. I hope one day, they will. This ends my chapter in SD46. It’s been 16 years as a math educator and 7 years as a school trustee. I would not be the person I am today without you, the people, and experiences in this school district. I continue moving forward to find ways to enhance the learning experiences of students. Right now, I am focused on teacher education in the north. Here I am in the photo visiting student teachers at schools during their short practicum. My interests continue to be math education, professional learning, assessment practices, policy, and leadership. I look forward to the next chapters in my PEDAGOGICAL JOURNEY. Each step is never easy and it’s not meant to be. I am grateful for the teaching, learning, and leading. These variables give meaning to my purpose. Thank you SD46 for being part of my journey. Today marks the last day of being a school trustee on the SD46 (Sunshine Coast) Board of Education. 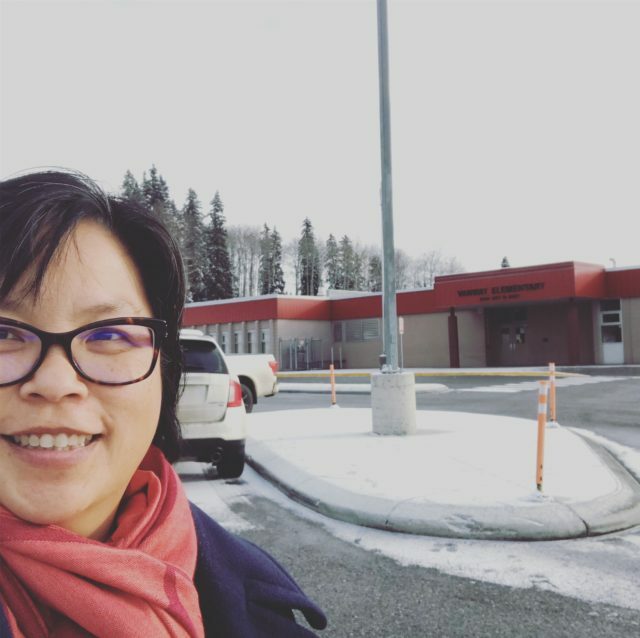 It was also the first day I drove in the snow to go to Quesnel and Prince George to visit teacher candidates in their schools during their short practicum. I have more visits tomorrow. My role has shifted into a new one. I’m still in education… like I have always been… but now I’m focused on teacher education. So far, so good. We have a great team a the university really trying to innovate and make learning meaningful for our students. I am really happy with our progress and optimistic about what’s to come. One thing I’ve been very grateful about my school trusteeship was meeting people. I met some pretty awesome school trustees and senior management. I felt very fortunate to make connections with educators and educational leaders who were aligned to my vision but also resonated with me in ideology and educational philosophy. Meeting these people fuelled my fire but also reminded me that there are other people like me in the field, regardless of role, trying to create a kind of change in the system to create learning experiences for students that are meaningful and memorable. In changing my role in education… again… I am heartened by the work of universities and all those involved to educate future teachers. The work is relentless, but the payoff will be so worthwhile. In trusteeship, I surrounded myself with good people. These people were not those who would leverage my profile or help me win elections. They were people I trusted, respected, and highly regarded. It was an eclectic bunch, but I loved each and every one of them. One thing about surrounding yourself with good people is that you also attract good people, if that’s “your vibe.” This takes deliberate action… of the self… but also who you seek to attract. I feel so lucky coming to Prince George of the people whom I already know from Twitter, school trusteeship, and my former teaching practice as a secondary mathematics teacher. These people are in my tribe… and I am meeting more. Surrounding myself with good people and taking the time to be in their space… to teach and learn… I feel very lucky. 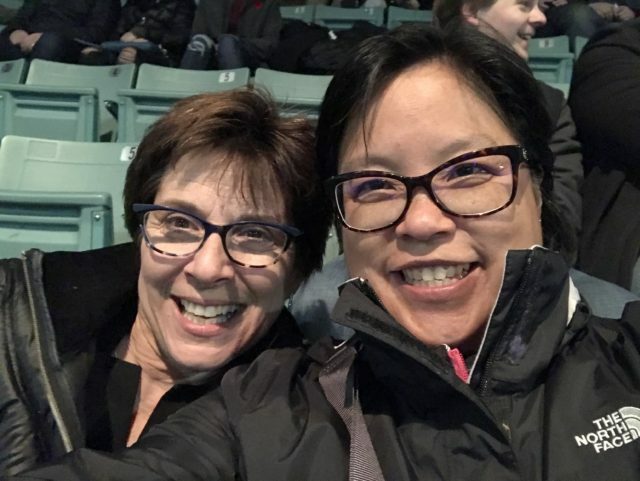 I also end my day off bumping into my friend at tonight’s community event… waved to another friend across the venue… and meeting somebody new sitting beside me. 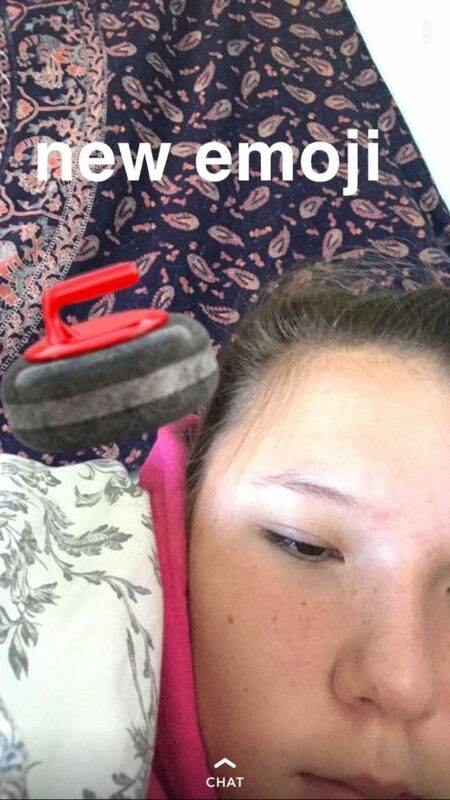 Moreover, my little family communicates with me via text and SnapChat as we exchange Bitmojis and everyday conversation as if we were under the same roof. Admittedly, I do love the daily dog pics my husband sends me. They just bring me a little bit of joy that I do appreciate. I will not take my little family, my family, my friends and colleagues for granted. Be happy. Be joyful. I am filled with gratitude. 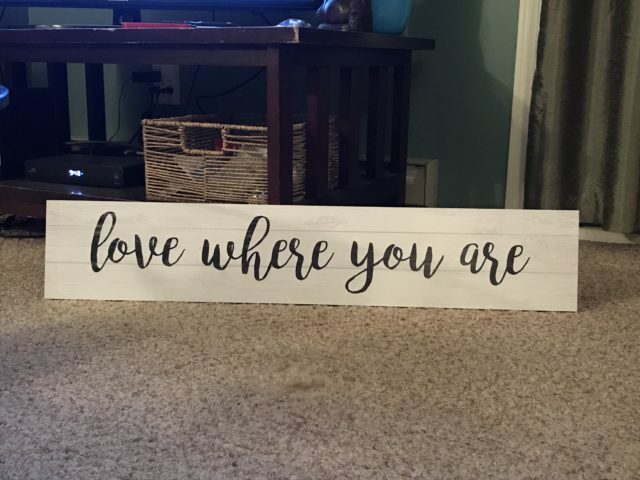 Love where you are… I saw this sign tonight and I had to get it. I had an incredible day with Dr. Susan Crichton and the Design Team today. We are spending 2 intensive days reimagining education. How lucky am I to be in the place at this time? I feel incredibly grateful and honoured to work with the people that I do and I am humbled to be a part of this work with my colleagues. Best of all, I love the students. They are resilient. My students teach me something new everyday. I love how the leave me thinking… and WONDERING. I love being in this state of mind. I love looking at the big picture and observing what makes something “good” or “bad.” Best of all, I love imagining what if. Is that creepy? I am always left in a state of wonder… as mentioned in previous blogs… I am wondering about assessment, structure, and student learning. That’s today… it’s likely that I will be wondering about something else… like learning resources, e-portfolios, and sense making. Learning is fun… and it’s ongoing. I have always been a curious person… thinking about my thinking but also thinking about why things are the way they are. I questioned a lot as a child. I don’t think my parents appreciated my questions that much. It often led to me and my dad fighting and my mom trying to bridge the gap between me and my dad. Nonetheless, I had questions. Admittedly, I did not question too much as a student of K-12 or as an undergraduate student. I was too preoccupied by “getting things right.” But as a K-12 educator and school trustee, I had plenty of questions to ask. Now, I am at the university as part of a redesign team and it’s almost like I FOUND MY PLACE. I am asking questions. I am contributing my voice. I am listening to others. We are working together to reimagine what teacher education can look like. It’s absolutely amazing particularly when leadership has your back. Truth… it’s something that I had always imagined to be a part of. Where we can be curious, be playful with ideas, and collaboratively come up with possible proposals for faculty to consider? WAY TOO FUN. However, to move forward, you have to LOVE WHERE YOU ARE. In saying that, it’s not about being content with the status quo. It’s about acknowledging where you are and being OK to walk away from old ways of being to transform into another. When we are not OK, that’s when we hold on to old ideas so tightly and thus, we can’t change. Yes… it’s true. 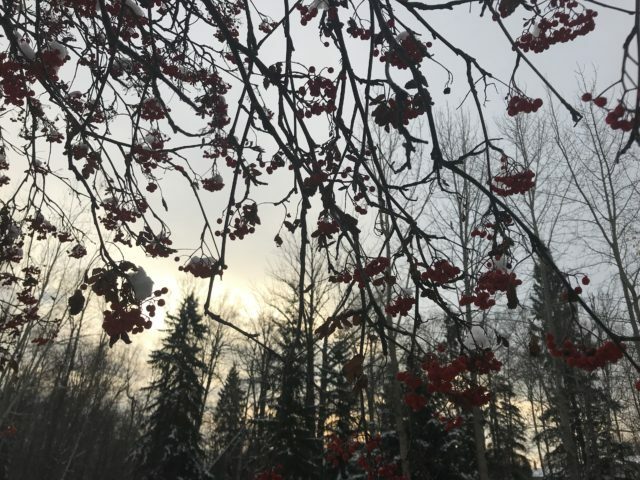 SNOW on November 1st… in Prince George. This is about the amount of snow that we get on the Sunshine Coast, BC. I know that this is just the beginning. This is a nice segway to my daily blog of learning. TEACHING IS LEARNING. I had an awesome teaching moment today. Students facilitated their learning activity today based on a lesson play they created within the time constraint of half-an-hour. They put their planning into action and I appreciated that my students can realize or “experiment” what their lesson plan could look like. The best part of that experience was asking these students to reflect on what they had achieved and determine if they were successful with their lesson plan or not. They took the time during class and returned back to me after class and said that they did but it could have been better if they added “why” to their questioning to deepen learning. Wow!!! I am always learning as my students learn. I know that I am “the teacher” or “the instructor” but really what that means to me is… I AM A LEARNER and I am imparting some of what I have learned but I continue to learn. It also reminds me of the messiness of teaching and learning and if we are to MOVE TOGETHER during this learning process, sometimes the course syllabus has to change, adapt, or modify. As a result, it looks REALLY MESSY, which can be scary because it may look like that I’m not planned in a detailed way. Sometimes I hesitate to create a course syllabus that is too detailed because you don’t know who will be in our class and how they will respond to the contents of your course syllabus. It’s a true dilemma. Stick to the syllabus or adapt to student learning??? The struggle is real but I choose the latter. Choosing student learning versus sticking to the course syllabus is a risk I’m willing to take but also a skill that I am learning how to hone. What I mean by that is, I hope to develop syllabi that won’t require me to make too many adaptations. I am also learning that STRUCTURE is really important to student learning. This is more than the time that the course is being offered and how tables are set in the room, but students do appreciate the comforts of structure to know what they have to do and need to learn to succeed. I understand that too. I hope that making these adaptations does enhance their learning experience in my course, but only time will tell. Taking it one step at a time. 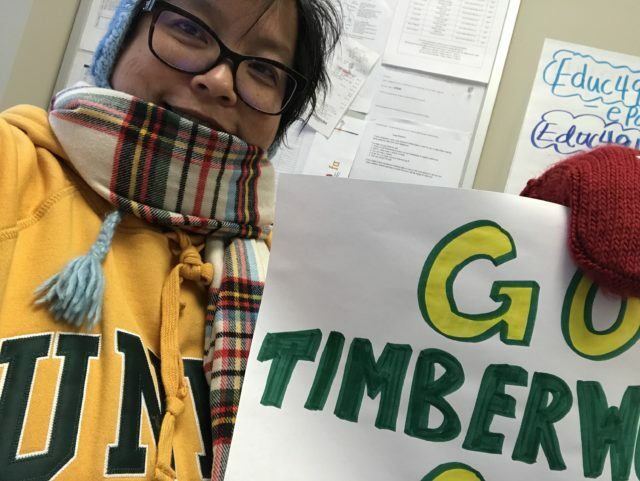 Happy Halloween… Yes, I’m an UNBC Timberwolves FAN!!! Thank you for noticing. That said, I am listening to the fireworks in my neighbourhood of College Heights in Prince George where I am “laying low” on this Halloween night. 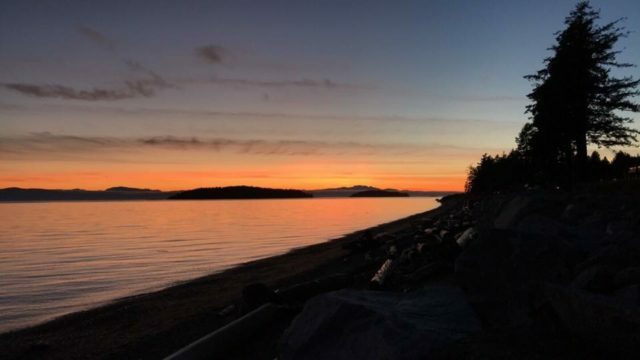 It the first night in 15 years that I’m not at home in Sechelt on the Sunshine Coast with my daughter where she would like to dress up, hang out with friends, and give out candy. I’m here… miles away living in an apartment building. NO ONE is coming by my place to “trick or treat” and that’s OK. It does not take much to make my day. I did have candy to give out to my class today. The student presenters brought candy too. We had gummies, licorice, and chocolate. A winning combination… especially when my students just finished a midterm exam in a previous class and I’m recovering from my fall from yesterday. Why not soothe the soul with a bit of candy? To top it off, today’s reading summary was about FORMATIVE ASSESSMENT and Assessment for Learning… one of my favourite topics to discuss and do in education but also one of the key underpinnings of BC’s New Curriculum. Lots of thoughts go through my mind as my students present a summary of the article and facilitate a learning activity based on that article. The article focused much about policies and systems, and how the framework of formative assessment should be found throughout the system to support and enhance student learning. It was a big article, meaning that it wasn’t focussed on the details of how to implement specific formative assessment strategies, but it revealed many of the big ideas of formative assessment and its value to student learning and quality of teaching. At the end of the presentation… “I tried” to clarify some ideas about assessment and what to expect in some of my course assignments, but I think I made it worse. I did not seize the formative opportunities. One of the underpinnings of my course is EXPERIENTIAL LEARNING. I was so compelled to “tell the answer” and I did. I think what I said only made sense to those who had already completed the assignment. I did not honour experiential learning cycle and allowing students to struggle. Well, I did with those who had already completed the assignment but there are still those who still need to complete the assignment. Nonetheless, all was said and done and we had only 10 minutes to get into our collaborative learning groups to design an interdisciplinary unit plan and lesson plan. After a couple of meetings and carbo-loading with a Tim Horton’s bagel (and some yummy cake), I returned to my office to pack up. I sat there for some moments to “catch my breath” and appreciate my surroundings. I needed to regroup. What was great was… one of my students popped his head in my door and cheered. I think that he was glad I was still here. It was getting late. There were two students… and yes, they were asking for some help. FORMATIVE ASSESSMENT and FORMATIVE FEEDBACK. I could not have asked for anything more. With some discussion, I hopped out of my seat to talk about the learning intentions and the assignment. YEEEESSSS!!! Formative in REAL-TIME. Students engaged in the struggle… and the AH-HA… for ME and my students. Love the formative. Not a morning person… but managed to drag myself out of bed… get ready… and make it to my computer by 9am for a conference call with members of the CIRCE Academic Council. If anything, it’s a great way to get inspired by others who are so passionate about imagination education in their research and fields. I am proud and honoured to be part of this group and hope to contribute in a meaningful way to move CIRCE forward. With CIRCE on my mind, I was heading to my car to go to work. With garbage to discard in one hand, my cell phone in the other, and my backpack on with my computer… off I went. Instead of taking my “normal” route to my car, I opted to take a different route. I was so caught up about thinking about the meeting and my day ahead… I TOOK A FALL. Save the phone. Save my computer. Save my head. Long story made short, all three were saved. 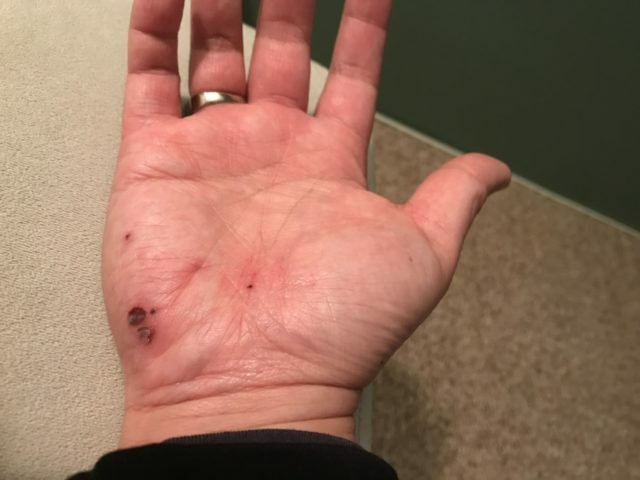 As a natural consequence, something else had to give… like my hand and ankle. I lied there on the ground for a bit. Admittedly, I wanted to get up right away but couldn’t. Literally, I’ve fallen and I could not get up. I stared at the sky for a few minutes, took a deep breath, and mustered the strength to get up and go to work. YIKES. This was a serious fall… well, more serious than I thought. Good thing you have people at work who can provide some pills, ice, and a little help to alleviate the pain. I’m not one to complain, but I was in a lot of pain. I barely made it back to my car after work. I was a slow walk, limp, and drag. I was so thankful to get back into my car to go back home. It wasn’t my best day… for work, for play, or for rest… but in the end, the message is, GET UP, march on, and don’t do that again. I tripped over a HUGE metal nut & bolt that was randomly situated on the ground. Why I walked on that path? Who knows? What I do know for sure is… the hot bath tonight is going to feel really, really, really good.